HIRÞ társasjáték - Magyarország társasjáték keresője! A társasjáték érték! A HIRÞ egy remek társasjáték, 2 játékos részére, az átlagos játékidő rövidebb, csak 10 - 60 perc. A társast, 8 éves kortól ajánljuk kipróbálni. A játékmenet erősen épít a terület befolyásolás/irányítás, az útépítés és a rács mozgás mechanizmusokra. 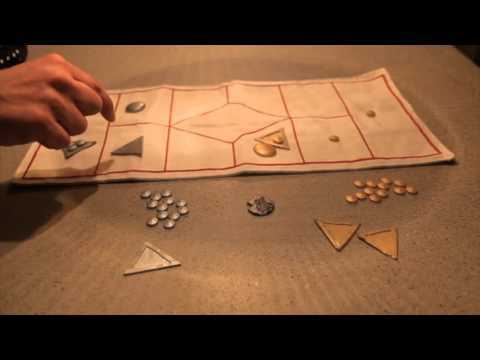 HIRÞ (pronounced hɪrð, i.e., with a th-sound as in "the" at the end) is a two-player abstract strategy game in which two leaders (Viking kings) fight over control of a piece of land. The first to either control the five middle spaces or push the other player's king off the board wins. Although it has a relatively small board (eleven squares), the ability to use moves to build stronger units makes the gameplay quite intricate. The game is designed in recent times but with the ambition of resembling a game that could potentially have been found in a Viking grave. In the game, the players start on each short end of the board and take turns. Each turn they can make five moves. For a move, a player either moves one piece (Hird or King) one step, moves a Hird into or off a Karve (boat), or moves a Karve and all Hirds on it one step. A Karve may have at most four Hirds on it. Pieces entering empty spaces have to stop. Pieces entering enemy-controlled spaces stop on the line between the spaces. After a player's five moves, any conflicts (pieces on lines) are resolved. All pieces except empty Karve are worth 1. The King is tiebreaker. In case of a loss, solitary Hirds are removed from the game, Karves and Hirds in Karves are removed from play, and Kings have to retreat to an adjacent empty or friendly space. If there are no possible squares for the King to move to, the player loses. If after their turn a player controls all five middle spaces, that player wins. There is also a doubling coin in the game affecting points received if several games are played. Normally a game is won after receiving five points.